Tenzin Gyatso, His Holiness the XIV Dalai Lama, has won the Nobel Peace Prize (1989), but even more importantly he has won the hearts of millions of non-Buddhists world-wide. Many who have heard him speak, whether in person or through the media, have been struck by his accessibility and his ability to relate to the human condition – which is rare for a religious leader, let alone one who is also a world leader in political matters. This book is composed of teachings and advice gathered, if you accept the basic premise of reincarnation, over the course of many lifetimes (in this case, 14). These lessons and advice are NOT couched in platitudes and generalities, but are related in concrete ways. Its small size (4.25 inches by 5 inches) and abundant use of white spaces belies the importance of many of the statements and ideas contained within its 400 pages. Do not allow either of these considerations to lull you into a belief that the contents are light-weight or unimportant, they are neither. 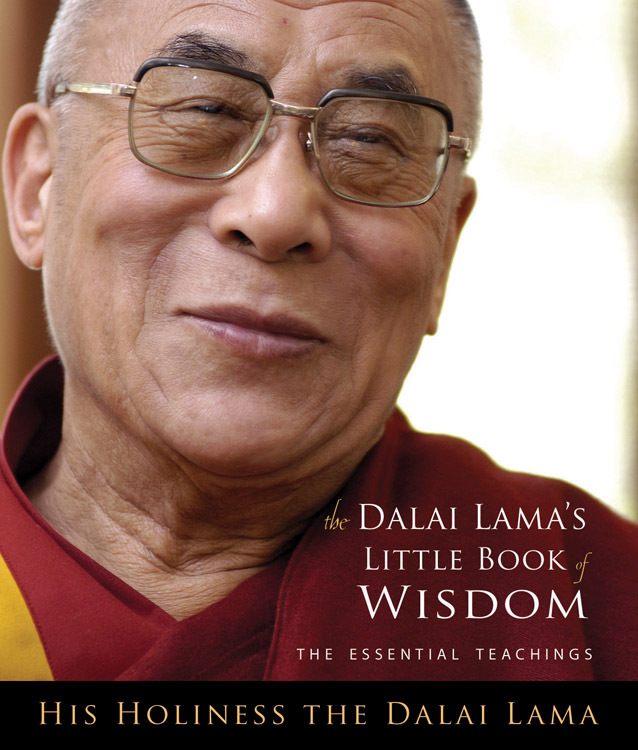 This book is a re-print of the 2002 The Spirit of Peace published by Thorsons (which was assembled from The Dalai Lama’s Book of Wisdom; The Dalai Lama’s Book of Transformation; The Dalai Lama’s Book of Love and Compassion). Unfortunately, multiple republications have not eliminated one of my pet peeves – editorial glitches. To be honest, such glitches are minor (dropped spacing between words and such), but for someone who spends as much time reading as I do it can throw off the rhythm established. I rely on that rhythm to help me get through anywhere up to 100 pages of reading a day. I seldom resort to skimming, as I don’t want to miss anything important, but if the glitches are frequent enough, I sometimes do so. That was NOT necessary with this book, fortunately. His Holiness stresses that attitude is very important in all aspects of life. If there is a way to overcome difficulty, there is no need to worry; if there is no way to overcome it, there is no use in worrying. Or, to sum it up in the words of a sometimes forgotten icon of American life, Alfred E. Neuman (the cover figure and representative of “Mad” magazine) – “What, Me. Worry?” It may seem simplistic, but it is a viable approach. His Holiness presents his lessons in the form of lectures. Each of them is relatively short, which makes it easy to absorb. He continually stresses the fact that, unlike what we have come to expect in the Western world, enlightenment and progress do not occur instantly, they take time and other things which are not currently in favor, like effort and repetition. This is not a book about Buddhist teachings. It is a book about world teachings, couched occasionally in Buddhist terms. Without a doubt, this book offers the reader a great deal to think about. Even more importantly, it offers goals to work towards, and methods to do the work.